On Saturday, December 19 2015, North Bank Lodge hosted its annual Installation of Officers for the ensuing Masonic Year. Worshipful Brother Jeff Brundson was installed as the newest Worshipful Master for North Bank Lodge by his cousin, W.B. Hal Croulet. In our January 2016 Trestle Board, WB Brunsdon reflected on the installation: "What a wonderful and humbling experience our installation was. My cousin, WB Hal Croulet, Jr., PM from Walnut, CA installed me as Worshipful Master. The remaining officers were installed by various Brothers from District #19 Lodges led by VWB Mark Sanders, Deputy of the Grand Master for District #19, as our Marshal." "My cousin also presented The Charge to the Master. 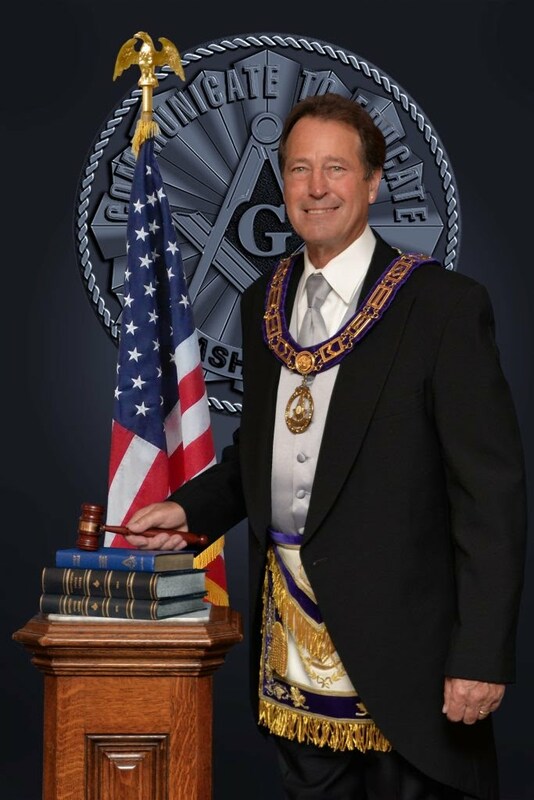 I want to especially thank our out-going Master, Don Fitzgerald, for filling the Worshipful Master position when we had an unexpected change in the line when our Senior Warden was transferred to a job out of town. His willingness to step up to this position allowed me the extra year to prepare for the East. It also provided me with the experience of attending the Leadership Seminar where I learned a great deal on how to lead the Lodge and also gave me a lot of ideas for having a successful year." "My cousin, WB Hal and my father were present at my raising in Big Bear, CA on December 14, 1983. And now, thirty-two years later, I have the great honor of sitting in the East. Brothers from around District 19 assisted with the North Bank's installation of officers, including VWB Jim Thompson, WB Steve Thompson, VWB Ray Zimmerman, and VWB Mark D. Sanders." In addition to the installation, the Hiram Award was presented to WB Malcom Parker by VWB Don Fitzgerald in recognition of "Brother Mac's" continuing work efforts in support of North Bank Lodge. Click here for some additional photos from this great evening. A hearty congratulations and well wishes for a prosperous and fun filled year to all!